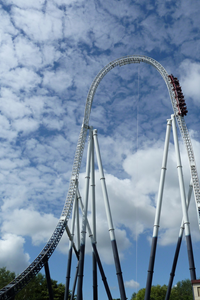 Easter Weekend: Which attraction wins out to keep the kids entertained, the humble British beach, or high-thrills theme parks? Many of us had enjoyed a well earned rest from work over the weekend, whilst some couldn’t wait to get back into the office after four days attempting to entertain the children, as well as some of their more distant relatives. But what do you do on a long Bank Holiday weekend? This week Rippll investigates which is the most popular attraction, Beach or Theme park? Traditionally, many of the 15 million vehicles that had hit the road network this Easter would have been travelling to one of the UK’s many beaches. But in these modern times, it seems that a visit to the seaside over Easter seems somewhat antiquated, with a portion of the population opting to seek thrills rather than relaxation and Ozone, at one of the countries many theme parks. Analysing data from some of Britain’s most popular beaches, alongside some of it’s most enthralling amusement parks, Rippll answers the question of whether the beach still takes the Bank Holiday crown, or rides are king. Which type of Attraction had the highest amount of visits during the Bank Holiday Weekend? Despite the British weather, beaches still remain a popular destination for those wanting to get away, and our report shows that out of the users analysed 48.94% went to one of the beaches we had looked at in the report, compare this with 51.06% of visitors that went to a theme park, it is almost a dead heat in terms of the most popular types of destination. It turns out that Brighton Beach, with it’s Victorian pier and close proximity to London, still has a huge draw with 27.34% of users analysed visiting the seaside town’s beach. Coming second is Bournemouth beach, which also has a glorious Victorian pier, showing the seaside is still a firm favourite with holidaymakers, with these two beaches recording 42.84% of overall visits. However, our amusement parks have a strong presence in the next 8 places, occupying 7 of the top 10 spots in terms of total visits. Legoland was the most popular theme park destination, followed closely by Alton Towers, with 18.37% of users going to one of these attractions when analysed. Where were our users visiting from? 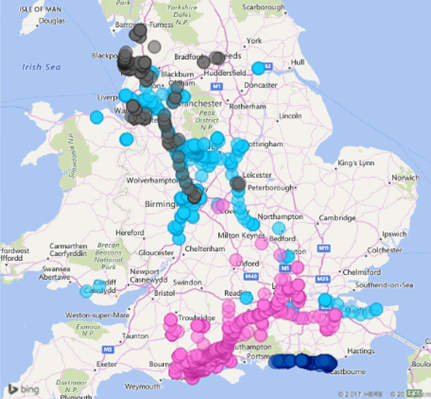 The maps shows the origin of the visitors to the locations that we have analysed, we can clearly see there is a trend for visitors coming from London to visit Bournemouth Beach (Pink circles), compared to visitors from the North having a tendency to go to Blackpool (Grey)and Alton Towers (Light Blue). We can also see that those in the south are far more likely to visit a Beach, with those living in Brighton and the surrounding areas, making use of the fabulous coastline at their disposal over the Bank Holiday Weekend. Looking at the map we can also determine whether road or rail was the most popular form of transport for revellers over the weekend. Road was by far the most popular form way to get to one of our locations, with the M1 being one of the most popular routes from those travelling to Alton Towers and Blackpool. Unusually we don’t see any users using the infamous Brighton — London mainline, indicating that, with over 250 projects planned for the four days, people had decided to hit the roads rather than risk being delayed by train services. Which attraction are users travelling further for? As the graph left shows, Flamingo Land had the highest average distance travelled from home at 85.6km. The opposite could be said for those who had travelled to Newquay beach, as it seemed to be more of a locals only affair, with the average distance travelled from home a mere 1.92km, enough to amble there and back. 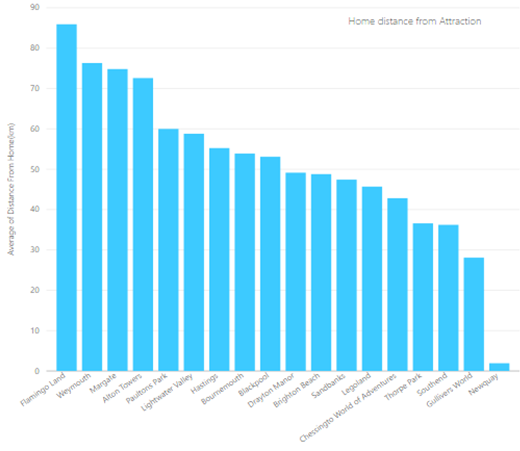 The average distance travelled for all of the attractions analysed is 50km, with the top five destinations in terms of distance travelled averaged more than 60+km. It was also mixed in terms of type of attraction, with 3 of the top five being Theme parks, indicating that Britons are willing to travel some distance for both beaches and theme parks.